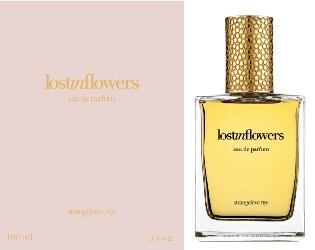 Strangelove NYC has launched Lost in Flowers, a new unisex fragrance intended as an "homage to newfound love". [...] An innocent yet seductive blend, lostinflowers, combines the euphoria of champaca from India with the gentle purity of muguet and real tagette flowers, the aphrodisiac power of natural gardenia enfleurage, the striking richness of saffron and the deep magnetism of rare oud. This happy fragrance features large amounts of pure and natural Indian champaca, one of the most expensive and rarest of ingredients in perfumery. Known for spreading joy and uplifting spirits, champaca was used in ancient times as a mood enhancer. Lost in Flowers was developed by perfumer Christophe Laudamiel. Strangelove NYC Lost in Flowers will be available in 50 and 100 ml Eau de Parfum, 10 ml rollerball or 1.25 ml perfume oil necklace. All those florals sound great. I don’t like oud at all, but I bet it’s pretty good with tagete. All I can think of is Peter Sellers.